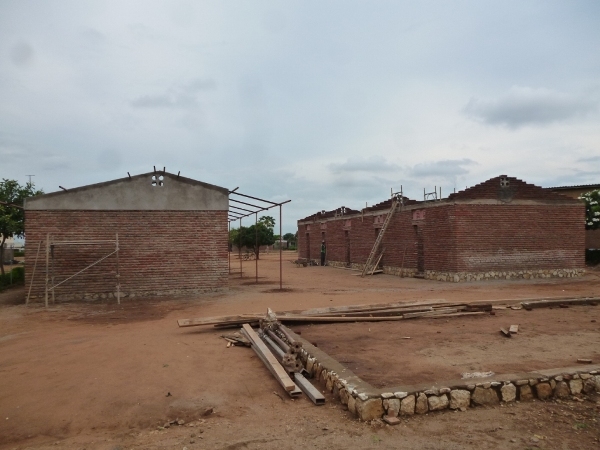 After 23 days the girls hostel block has reached the roof level and contractors have started working on the second hostel block. Thanks to Franco and Marandimo Building Contractors for their dedication. Andiamo Education Institutions (AEI) students planted 1000 trees in Balaka at Andiamo Campus on 11 February 2012 as one way of restoring the natural beauty which was carelessly destroyed. The function was organized by Wildlife Club of AEI, and in attendance were representatives from all the sections of Andiamo Youth Cooperative Trust. Isaiah Kaliponda, the Chairperson of the club said that it is the aim of the club to make sure that the natural resources are being taken care of and where trees were cut down should be replanted. He added that trees play a very important role in human beings by providing good oxygen and also makes our country looks beautiful. Balaka District Forest Officer Mr Kamwendo, who was the Guest of Honour at the function, thanked the students and Andiamo Youth Cooperative Trust for being concerned with the way people have carelessly cut down trees. “40 years back people were living healthy lives. Trees were everywhere and they were breathing clean oxygen but because of industrial revolution, the good air has been polluted and people are not protected to this bad air.Because of this problem, babies are being born with different abnormality and people are experiencing some strange health problems but we can restore the good environment we had years back by planting more trees in our areas,” said Mr Kumwenda. Andiamo Executive Director Andrew Galeta, encouraged youths to continue taking part in tree planting as it also attracts tourists and also help in the formation of rain. He took time to advise those who are pursuing Carpentry and Joinery course to be in the forefront in planting more trees as their job involves the use of timber which comes from these trees. Also present at the function was Don Cesare and the Coordinator of AEI. In a related development, Fr Mario lost his cool on 13 February when he noticed that some of the ground workers mistakenly cut down a big mango tree that had survived for some years in the AEI campus. Like in the “Lost Sheep” parable, Fr. Mario wondered how some people could think of cutting a matured mango tree when the Trust is busy planting more trees.